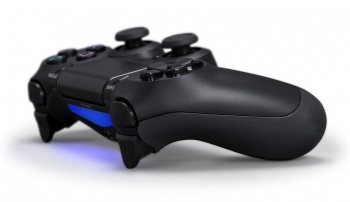 Developers weighed in on DualShock 4 design, and Sony listened. For the first time in the history of the PlayStation brand, Sony has introduced a completely redesigned controller. The DualShock 4 was shown off publicly for the first time at the company's PlayStation 2013 event in New York, and now we're beginning to learn just who had input on how the new controller turned out. "We all had a secret meeting after E3 last summer and shared our own prototypes, we called it our science fair," Evolution's Matt Southerns admits. "There was lots of very open feedback and constructive criticism from a wide variety of studios. That was important because it meant we could build a controller that was a design classic but also embraced a new age." And when it came to ergonomics, Killzone developer Guerrilla had plenty of advice to offer, most notably the desire for curved trigger buttons, rather than the slanted designs we've seen on PlayStation controllers for two generations now. "We also pushed for the headphone jack because we wanted to lower the threshold to multiplayer gaming," Killzone: Shadow Fall director Steven Ter Heide explains. "Everybody should be able to go online and chat. It ended up on there and it's awesome. These sounds like really simple features but it makes all the difference; and just those little tweaks to the indentations on the sticks - they're slightly raised so there's more positioning. It feels really nice."